In our last blog for The Developing Story, we discussed how obesity and body fat contribute to girls’ earlier pubertal timing. We did not, however, dive much into diet or specific dietary factors. One issue we are often asked about is soy. Many parents are concerned that soy may accelerate puberty because of its estrogenic effects. It is true that soy contains phytoestrogens, which may mimic estrogen in the body, and as such, is often a suspect in early puberty. However, the evidence that soy disrupts puberty, and if so how, is far from clear cut. In fact, a recent longitudinal study by our colleagues in the NIH-funded Breast Cancer and the Environment Research Program (BCERP) suggests that soy intake might even delay pubertal onset in girls. There is epidemiologic evidence that women who consume soy as young girls have lower breast cancer risk. This risk seems to normalize to background rates for these women’s daughters if they are raised in areas with less soy intake, for instance if the food culture changes in a region, or there was immigration to a country with different eating habits. Thus, the lower rates of breast cancer in certain Asian countries, for instance, are not likely explained entirely by genetics but may reflect diet. As mentioned, research from our work with colleagues in a longitudinal study of 1,200 girls suggests that girls with more soy intake may enter puberty later than those who eat less soy. In contrast, recent cross-sectional work, based on self-report data, has shown no effect of soy on timing of first menses, but study design issues make these data difficult to interpret. Animal studies have suggested that exposure to some soy proteins in immature animals may lead to an earlier puberty. Some of these data focus on isolated isoflavones, not whole soy. Isoflavones are complex, and when separated, may have differing biological effects than the whole soy plant. For example, genistein exposure may cause earlier pubertal development in rats, but the same has not been shown with whole soy exposure. Of particular concern is soy protein isolate, which is a heavily processed form of soy with differing balance of isoflavones that the soy bean; some experts are concerned that this alternation in balance may lead to differing effects of processed soy vs the whole bean. In addition, the timing of soy intake may be important. 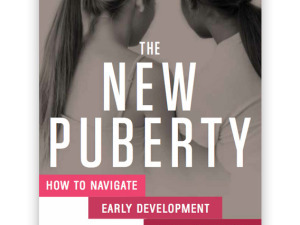 There are very few studies measuring soy consumption during the early childhood years that have then followed girls over time as they entered puberty. In terms of diet and soy, we suggest a cautious approach. Given that soy is an excellent source of protein in a balanced diet, we think that whole soy foods are a good choice for developing children, both boys and girls. Note the emphasis on whole soy foods — the evidence suggests that this should include relatively unprocessed soy foods such as edemame, tofu, soy milk and tempeh. We suggest staying away from heavily altered soy products such as soy protein isolate. And to address a question we field regularly, the jury is still out on infant soy formula. 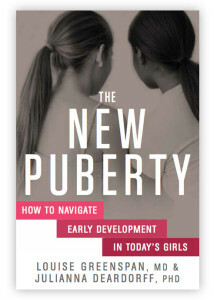 The New Puberty: Why are Girls Starting Puberty Earlier?